If you’ve never tried vegan sushi before, I encourage you to give it a whirl! This was my first time making it myself and it was a COMPLETE success. This tomato spicy tuna is healthy, flavorful, and a snap to prepare. Rolling up vegan sushi rolls with no experience and no mat may seem daunting but fear not dear friends, you only need plastic wrap and a kitchen towel to get compact, restaurant quality rolls in the comfort of your own kitchen. Trust me, you will feel like a BOSS rolling these up. Also maybe a little silly for paying so much for sushi at restaurants but maybe that’s just me. Since becoming a vegan, I haven’t really gone out looking for vegan sushi restaurants. Typically a vegan sushi roll consists of cucumber and avocado as fillings. Don’t get me wrong, I love all that but who wants to pay $6 for two slivers of cucumber rolled into rice? That’s where the tomato spicy tuna comes in. With the right seasonings, tomato flesh tastes remarkably like fish. In fact, the day after making these vegan sushi rolls I had some leftover in the fridge. The flavors had melded together in the way things do overnight and the tomato spicy tuna tasted so much like real fish, I didn’t want to eat it. My husband scarfed it down though! If you aren’t vegan and still enjoy seafood sushi, I’d like to kindly suggest trying this tomato spicy tuna instead. Two reasons! 1- According to many recent publications, a lot of the fish ordered in sushi restaurants is actually low grade substitutions. So that spicy tuna may not even be tuna. Mystery fish? No thanks! 2- At current commercial fishing rates, experts predict the oceans will be depleted of fish by the year 2048. Missing such a vital element of the ocean’s food chain could have disastrous effects on the environment. So try this vegan sushi! You will be amazed by the tomato spicy tuna, trust me. It’s a win-win for your taste buds and the oceans! If you try this vegan sushi recipe, please leave us a comment and tell us how it went and post a photo on Instagram with the tag #carrotsandflowers. We want to hear all about your tomato spicy tuna adventures! The BEST vegan sushi ever, no bamboo mat required. Perfectly seasoned tomato spicy tuna replaces fish in this healthy, plant-based meal. Ready in 30 minutes! * For detailed visual instructions on how to roll your sushi, check out this helpful guide by Minimalist Baker. For more deliciously creative ways to use tomatoes, check out our Vegan Chicago Style Deep Dish Pizza or our Vegan NY Style Bagels with Tomato Lox and Cashew Cream Cheese. To save this vegan sushi recipe for later, pin the photo below! We love connecting with you! Come say hello on Facebook, Pinterest, Instagram, and Twitter! Any particular type of kelp powder or is kelp powder all the same? I found some on Amazon that I was going to get. Link to lox recipe please! How long should the tomatoes stay in the marinade? You can use it right away or wait up to 30 minutes or so. The longer it stays in the marinade, the closer it will taste to real spicy tuna, so it’s up to you how strong you want the flavor to be! We loved it! It was awesome! Yay, awesome!!! So glad to hear it, Happy New Year!! Ok this looks brilliant!!!! I can’t wait to try it. I will definitely give you feedback. Also, should #4 say “Cut the CUCUMBER” instead of “Cut the tomato”? Oof! Yes it should, thank you I will correct it now! Yayyyyyy that is fantastic news! Thanks so much Tracey, so happy you both enjoyed the recipe! Does this make one roll? Are all 3 rolls for one person? Or how many servings is this? Any chance for the recipe of that greeny thing on the side? is that wakama salad or something like that? I used a store bought seaweed salad for this for styling purposes, although it was very delicious! Wow, this was absolutely INCREDIBLE! I was super skeptical, because I HATE tomatoes, but I honestly didn’t notice the difference. This was seriously so amazing. THANK YOU! Sushi is the one thing I really missed since going vegan. We made this last night and it was delicious! The sauce mixture did become rather gelatinous from the kelp powder, which we got in the medicinal herbal section of Central Market. Is that supposed to happen? It didn’t hinder the taste or anything, just wondering if that’s typical with kelp powder. Same here. I’m in the process of marinating it. It’s so thick I couldn’t toss it. It had to be stirred. Clearly, kelp powders are not the same. Also, putting the pounds of tomatoes would be helpful. I doubled the recipe and there seems to be too much sauce. I am going to try to make this tonight. Can I use kelp granules instead of powder? I assume they are similar…. I’ve never seen kelp powder at the store but I do have kelp granules in my kitchen and was just going to use that. Didn’t have kelp seasoning or dulse flakes, so just went with some katsuboshi. Not vegan but tasted pretty good. I just made this and it tasted just like sushi! I am pregnant but love sushi so this is literally my saving grace. Thanks you for sharing! I didn’t have any help powder, but a little bit of white miso did the trick! This is amazing. Thank you! I love your recipes and your site. I also, love that you have a print button with your recipes, but I wish when you click the button it would include the photo in the print version. Just a suggestion. Thanks for your feedback, I’ll look into that! How long will the tomatoes last? Could I make the tomato part ahead of time, like the night before? Can’t wait to try! Raw meat often contains a ridiculous amount of parasites per square inch. 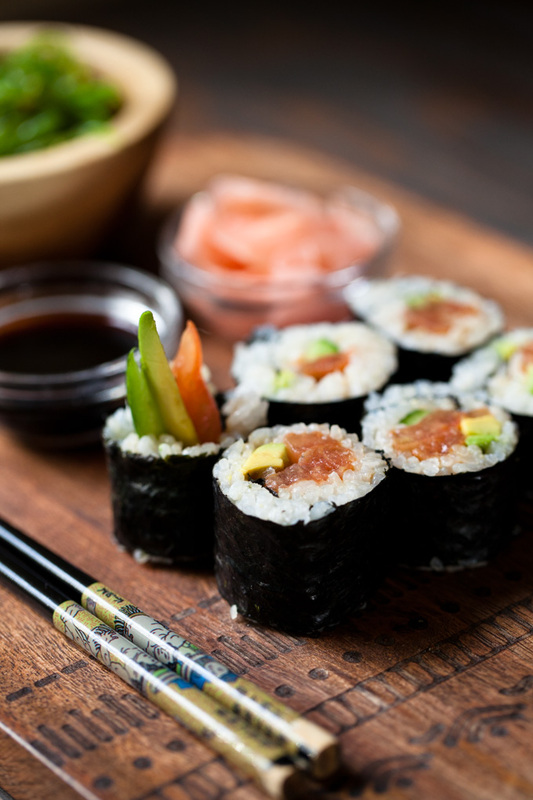 People who eat sushi regularly typically have a higher amount of parasites inside them compared to others. My kids -all four of them – LOVED the spicy “tuna” #winning thank you!! So damn good. I make it on the regular. Anyone know whether I could substitute spirulina powder for the kelp? This is one of my new favourite things to make. I was so excited to make this for my brother in law who is now vegan and was missing sushi. He loved it! Thanks for the recipe! This tasted insanely real. I fooled my dad who loves Tuna! Even after I told him it was tomatoes not tuna he didn’t believe me. Could this be made without the Kelp powder? I have never used it before–what does it do here? flavor? texture? nutrition? Just wondering. Thanks! The kelp powder provides the fishy flavor. You can also use nori flakes for the same effect. 🙂 Hope you love it! DANG GIRL!! You knocked this one out of the park. Incredible flavor. I’ve made this many times but am now coming back to comment. THANK YOU!!! Surprisingly really delicious. I’m not vegan but I love to try new recipes. Of course it doesn’t actually taste like actual tuna but the marinade is so good you don’t miss it. I made mine with some diced avocado and kewpie mayonnaise, their creaminess really complements the spicy marinade. Thanks so much for the feedback Lucille, I’m glad you enjoyed the recipe! I made this today with jackfruit instead of tomatoes. YUM! Will try with tomatoes in the summer when the garden is full of delicious tomatoes. Great flavor! Thanks for the recipe!